Right now I’m using an A5 dotted Leuchtturm1917 in lemon yellow and a .38 Pilot G2 pen in black. I attach the pen to the top of the notebook with a Leuchtturm1917 pen loop. The reason I like it at the top is so I can easily see any tabs and magnetic clips on the side and quickly turn to the next page. Also, putting the pen on the side crushes the side tabs. The first 43 pages of my BuJo are my Tickler. 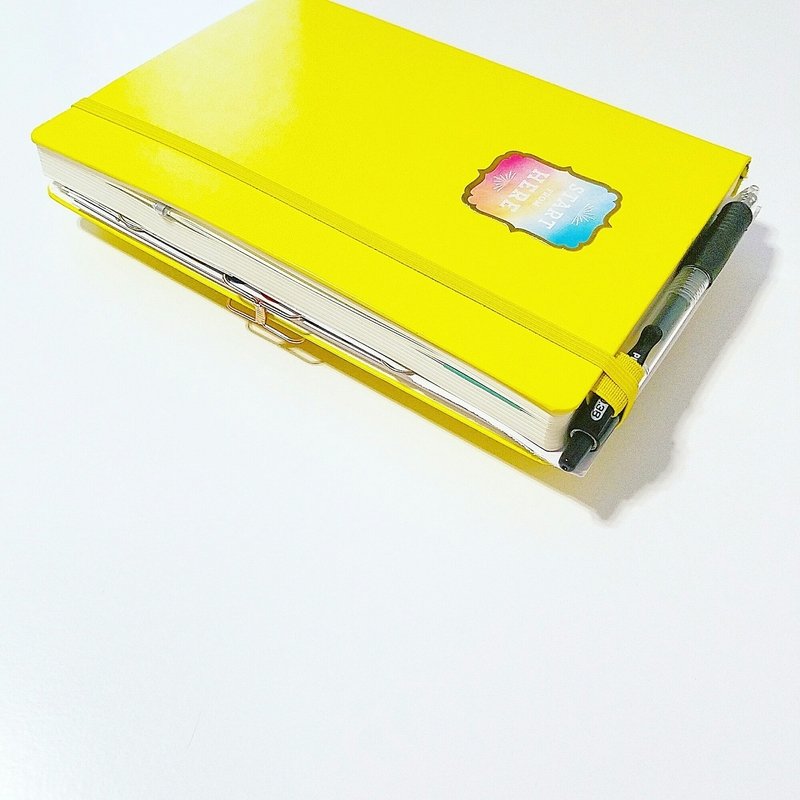 This is a GTD concept that I’ve adapted to use in a notebook instead of file folders. The first 31 pages are for days 1-31 and pages 32-43 are for the 12 months in a year. This is a perpetual calendar so I need to reuse the pages. 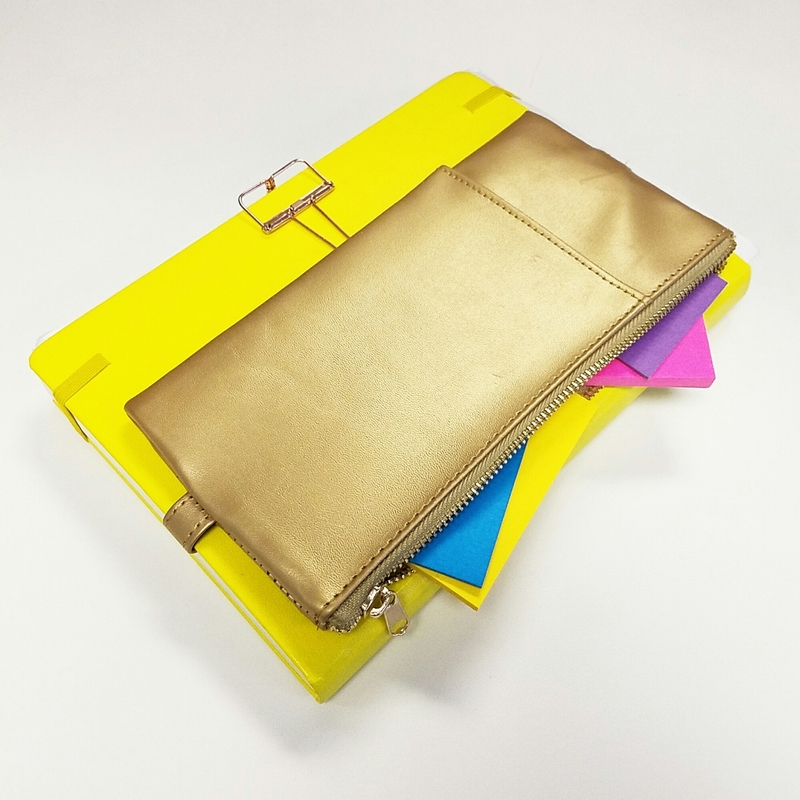 Because of this I do not write on my Tickler pages: I use sticky notes that I carry in a pencil case attached to the back of my BuJo. I use a Tickler in place of a Monthly Log and a Future Log. The rest of the pages are for my Daily Log, Collections, and Notes (I differentiate between Collections and Notes because my Notes are not actionable and my Collections are). 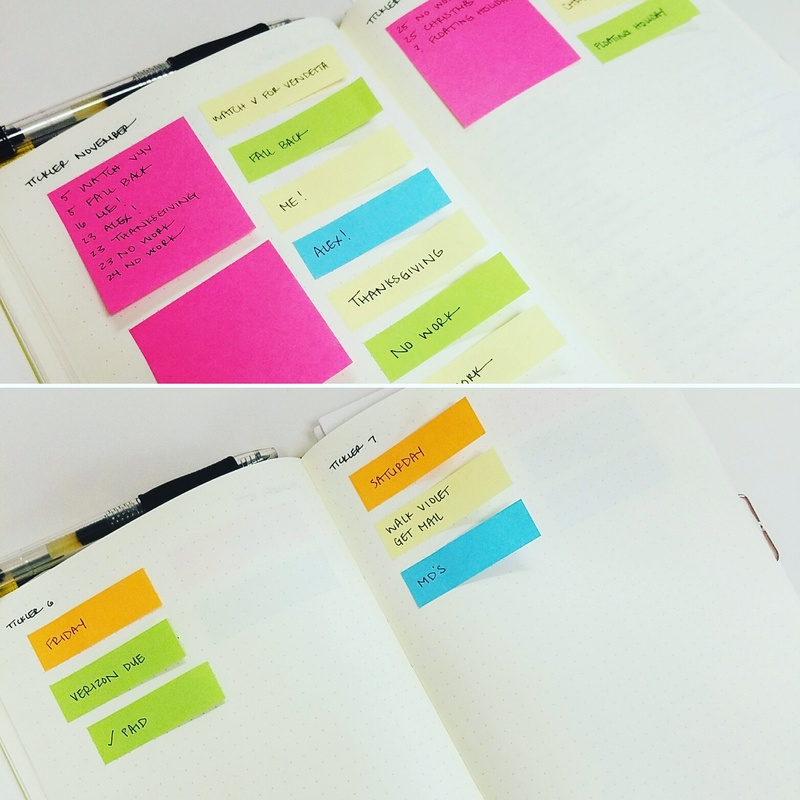 I do not write my Daily Log, Collections, and Notes on separate pages; I write everything inline with a divider line in between. I’m not sure why, but I greatly prefer this layout. To process my inline section I use Mark Forster’s “Fast FVP” system. I start with the first actionable item in the whole inline section, and, ignoring the line breaks, process the entire section as if it it was one FVP list. That means all the collections are processed in between all the daily logs. I really like this because I usually write a collection and never look at it again except to add more to it. With collections being processed at the same level as my Daily Log I can never forget about them. That’s my whole system for now. Feel free to leave any questions or comments. Thanks for reading! Field Notes 56-Week Planner as my calendar. 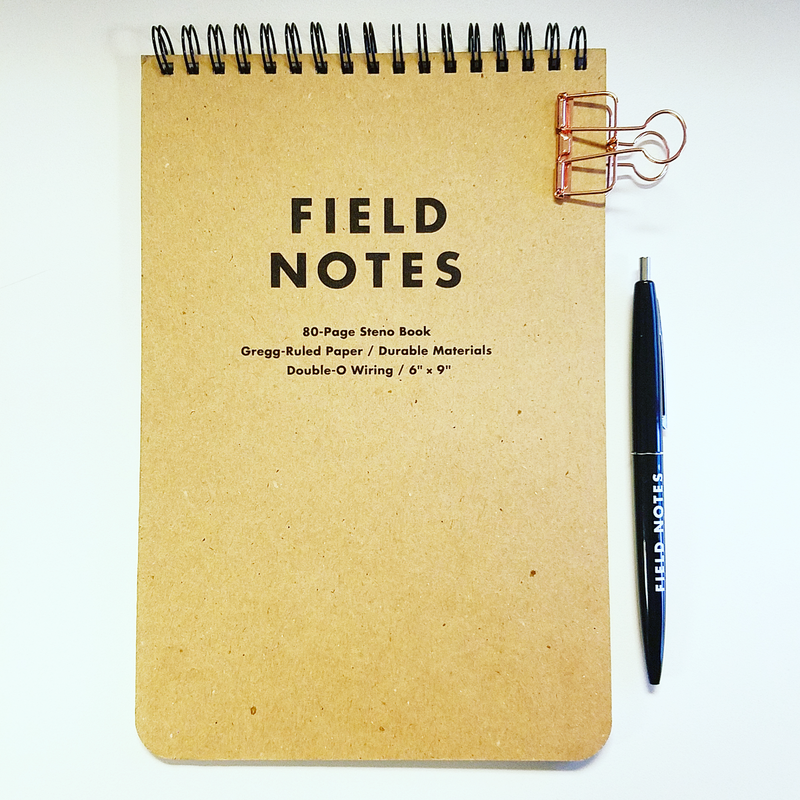 Field Notes Steno Pad as my work planner. 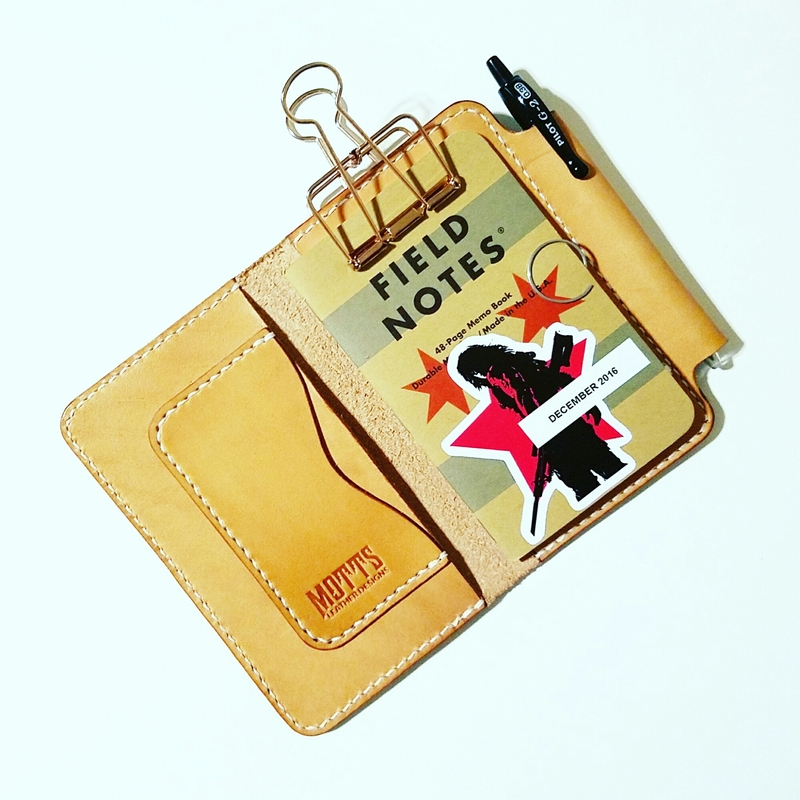 Field Notes Memo Books as my everyday carry planner. The calendar is a horizontal week on two pages planner. I simply list any date specific and time specific events and tasks here. I carry this around with my in my purse in case anyone asks my schedule. Other than that I only take it out at night when planning the next day in my everyday planner. I also list my work hours here. The work planner is a Gregg-ruled steno pad. I have a pretty neat system for this. It’s like a modified Cornell Notes. Each project I work on at work gets one page. First, I trace the line down the middle of the page. On the left side, I count 5 lines up from the bottom and trace the horizontal line there until I get to the line I drew in the middle of the page. The bottom left corner is where I put the title and description of the project. the top left is where I list all known next actions for the project. The right side are notes on the project. I tear out each page as I make it. I line up the pages in the order I want to work on them, with the right most being the one I want to work on first. When I line them up I overlap the pages so the right half is covered on all of the pages except the first page. This way, I can see all the project titles and project tasks at once, and I can only see the notes of the one I’m working on now. 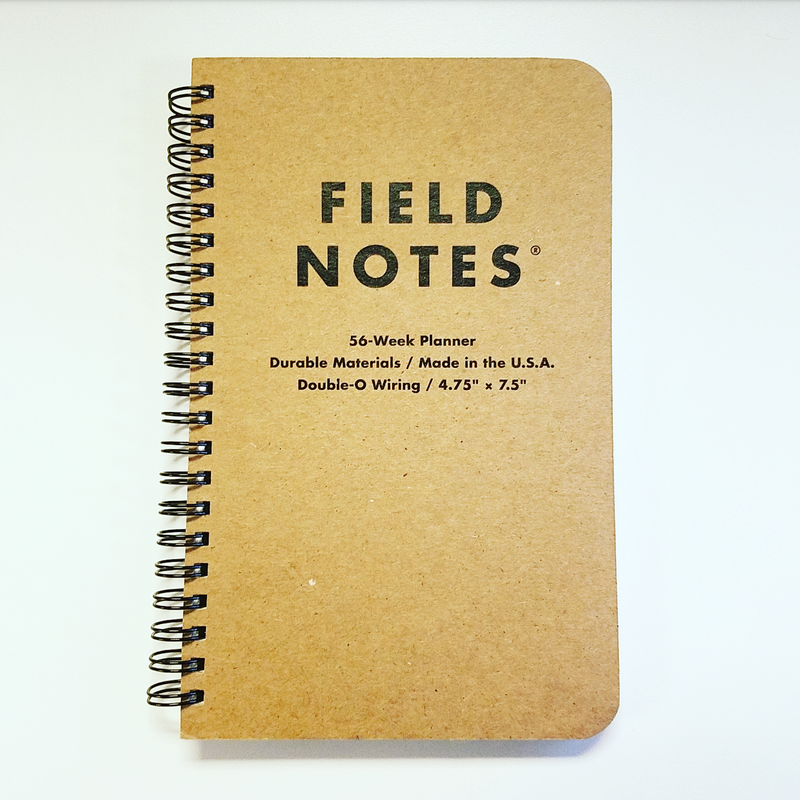 I carry a 3.5 x 5.5 grid paper Field Notes Memo Book with me wherever I go. Inside I have two pages per day for two weeks in the front of the book. In the back I have notes, and running lists for tasks that are not assigned to a particular date. Urgent things that come up during the day. The left page is reserved for notes, shopping lists, agendas, waiting lists, etc. that all have to do with the date on the facing page. Starting from the last page in the back I write down my master to do list and all other lists and collections that aren’t assigned to a date yet. I also write down any notes that I want to live past the current date. If the notes are not needed after today is over, I’d simply write them on the left page of my two-page dated spread in the front. The system I use to work my daily to do list is an adaptation of Mark Forster’s “SMEMA” time management system. I call it Echoes. On the left side of my daily pages, the notes side, I write down “Echo A” and then list the 3 things I want to do next in order. The three things should be pulled from the daily list. The three things must be able to be done in this context (this location and time block). I continue listing 3 things for “Echo B” and another three things for “Echo C” and so on, until everything I want to complete or work on in this context is listed. Now the reason this is called Echoes is this. When you’re ready to start on the first 3 things, shorten their descriptions until you get them to one or two words. then, repeat these words in order, over and over again in your head (or aloud if preferred). For example, if my “Echo A” list is “take clothes out of dryer, walk dog, get mail” then my echo will be “Clothes, Walk Dog, Mail.. Clothes, Walk Dog, Mail… Clothes, Walk Dog, Mail…” etc. When I finish taking the clothes out of the dryer I change my echo to “Walk Dog, Mail… Walk Dog, Mail… Walk Dog, Mail…”. when I finish walking the dog I just repeat “Mail… Mail… Mail…” until I’m done getting the mail. When all three are done, I go back to my planner, check off the three I completed, and make a new repeating list of words for my “Echo B” list. And so on until all of my pre-made Echo lists are complete. If at any point something urgent comes up that I need to complete in the middle of my Echo, just add it in after the task you’re currently working on. “Clothes, Walk Dog, Mail” becomes “Clothes, Trash, Walk Dog, Mail” after I notice the trash can is full and I should take it out immediately. GTD, or Getting Things Done, is a system by David Allen. 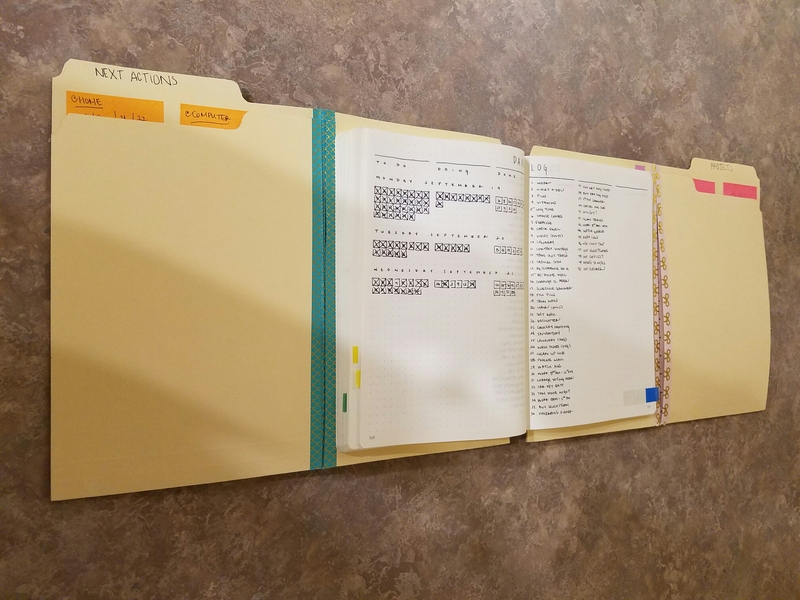 This post will cover how I’ve adapted the GTD Tickler file in my Bullet Journal. GTD, or Getting Things Done, is a system by David Allen. This post will cover how I’ve adapted GTD to my Monthly Log. GTD, or Getting Things Done, is a system by David Allen. 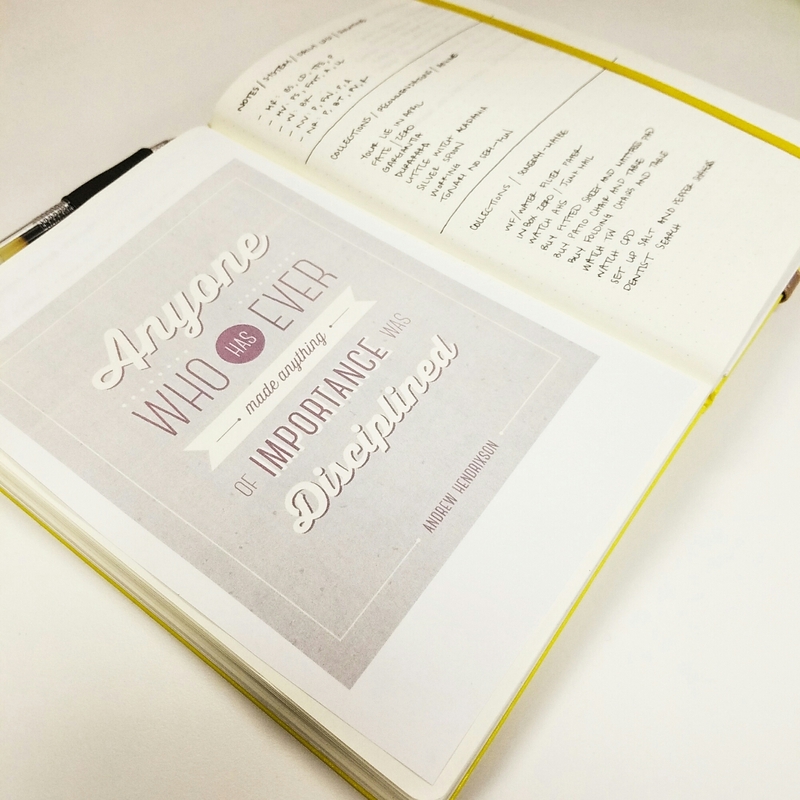 This post will cover how I’ve adapted GTD projects and next actions in my Bullet Journal.